There are many ways to achieve whiter teeth. From over-the-counter teeth whiteners to professional teeth whitening treatments, a wide range of options are available. Depending on your budget and teeth whitening goals, there are products and treatments that can meet your needs. If you are in Osprey or Saraota, FL and have questions about teeth whitening, Dr. Sean R. Bates, can help. Over-the-counter teeth whitening options include whitening gels, toothpastes, strips and rinses. The level of whitening achieved can vary between product types and brands. For instance, whitening strips tend to achieve better results than whitening rinses because they are applied directly to the teeth for an extended period of time, whereas rinses are swished around for only a few minutes. Even among whitening strips, though, results might vary from one brand to the next. One advantage of over-the-counter teeth whiteners is that they are usually more affordable than professional treatments. Another advantage is their convenience. Over-the-counter whiteners can be done at home and according to your schedule. They are also fairly easy to use. A variety of at-home teeth whiteners are available at stores throughout Osprey and Saraota, FL. While there are several advantages to using over-the-counter teeth whiteners, there are also some drawbacks. Some products might not contain enough bleaching or whitening agent to achieve good results. Other products can contain too much and be harsh on your teeth or irritate your gums. Further, you don’t have the benefit of an experienced dentist to assist you if anything goes wrong. 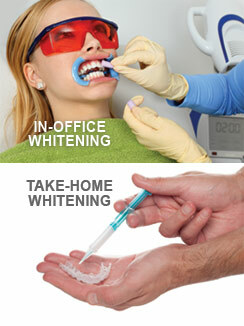 Professional teeth whitening treatments are typically done in the office. Your dentist will apply a whitening agent directly to your teeth, while protecting your gums to prevent irritation. The procedure takes about an hour. An alternate method that can be done at home utilizes trays that your dentist custom fits to your teeth. Your dentist will provide you with a professional whitening gel to be used at home with the trays. 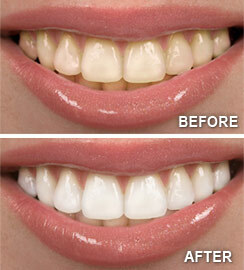 In-office treatments and custom fitted trays both provide professional quality whitening results. A major advantage of professional teeth whitening treatments is improved results. Professional treatments produce whiter teeth in a shorter time period than over-the-counter products. Teeth also remain whiter longer with professional treatments. Additionally, professional whitening treatments are reliable, safe, and effective. The primary disadvantages of professional treatments are that they are more expensive than over-the-counter options for whitening teeth and an appointment is required. Over-the-counter products and professional treatments both provide a range of options for whitening teeth. Over-the-counter methods are convenient and tend to be more affordable. Professional treatments deliver excellent results under the care and supervision of an experienced dentist. Dr. Bates offers professional teeth whitening in the Osprey and Saraota, FL area. Interested in Teeth Whitening from Sean R. Bates, DDS & Associates? We serve the Osprey and Saraota, FL area.